I found it. FINALLY. The perfect vanilla cake-recipe. I’ve had some disappointments in the past – the recipes I tried were a little too dense, a little too coarse, a little too dry, etc. But this, everyone, this is the absolute perfect combination of moist, light, and fluffines that will blow your mind. I am a fan of most bakery’s cupcakes in the city – Magnolia, Buttercream Bake Shop, tbsp, and Sugar Sweet Sunshine. I want to try all of them! 1. I love a light, whipped frosting so I highly recommend this one. I’m also a little paranoid lately about all the artificial chemicals in food-coloring so I made my own using crushed cherry-juice. I think it was worth it and looks decent! 2. I know there’s an insane amount of pictures, but it’s because I think cupcakes are so dang cute. In a large bowl, combine your dry ingredients – flour, baking powder, baking soda, and salt. Set aside. Using a stand mixer, cream butter and sugar until nice and fluffy, around 2-3 minutes. Add vanilla, mix 1 minute. Add eggs, one at a time, mixing thoroughly after each one. Mixture might look curdled, it’s all good! Add milk and oil, mix well. Add flour mixture in 2-3 installments, and mix until JUST combined. Over-mixing = death of a light, moist cake. 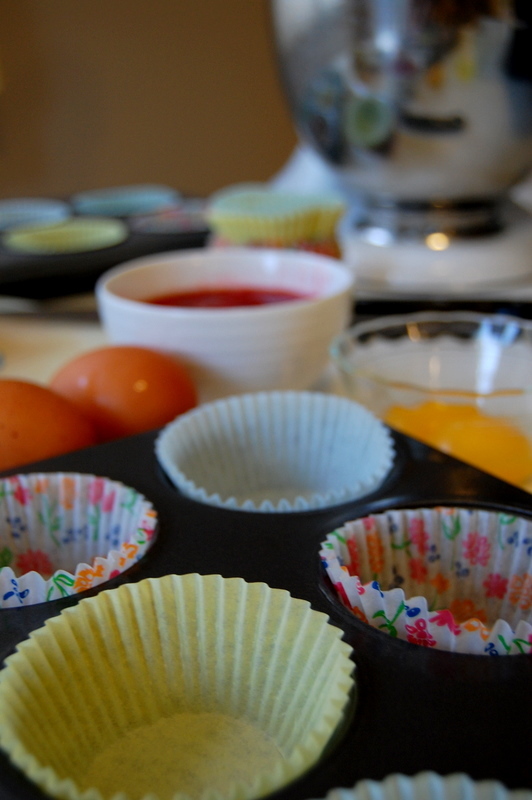 Line your cupcake pans with cupcake liners, and add around 2 heaping tablespoons of batter to each. They should look around 2/3-3/4 full. Don’t put too much batter or else it will spill out of the pan. Bake at 350 for 18-20 minutes, mine took 19 minutes exactly. COOL COMPLETELY BEFORE FROSTING OR ELSE YOU WILL HAVE A FROSTING DISASTER! 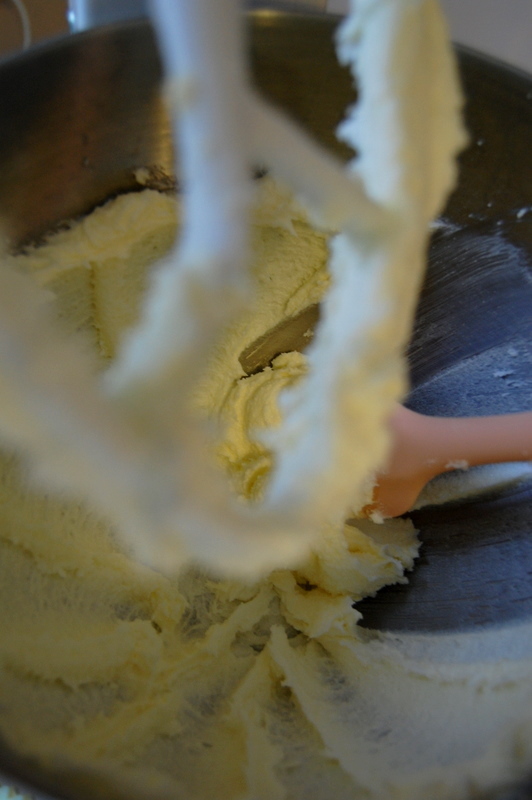 In a stand-mixer, cream butter until smooth – around 3 minutes. Add powdered sugar 1 cup at a time, milk, and vanilla. Mix until desired consistency. 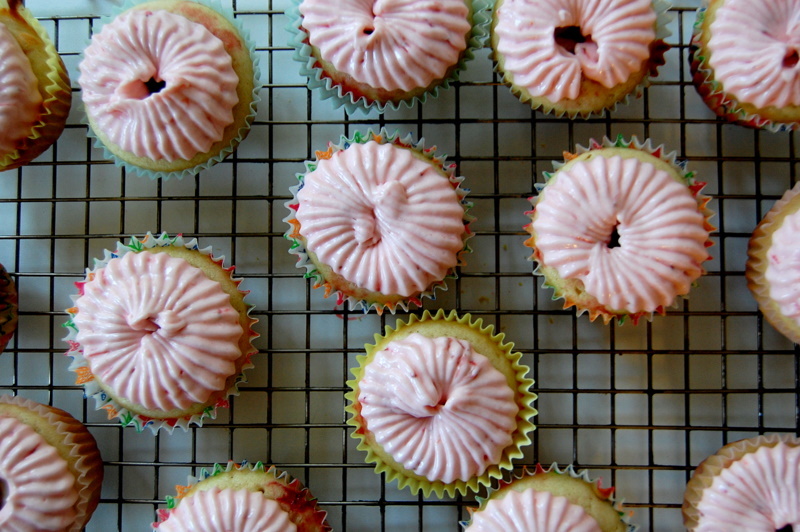 I frosted half with white frosting, and half using the crushed-cherry-tinted ones. Go crazy! In honor of my darling Serena’s birthday, I baked these cupcakes for her “surprise” dinner at Tartinery. 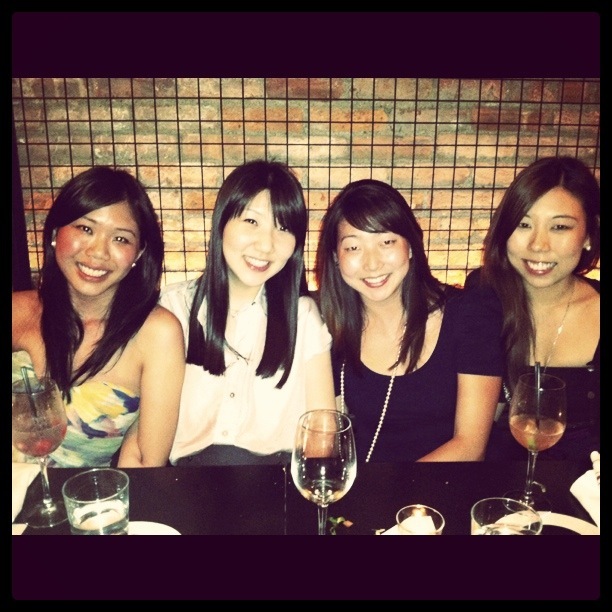 Happy 26th doll! 1. 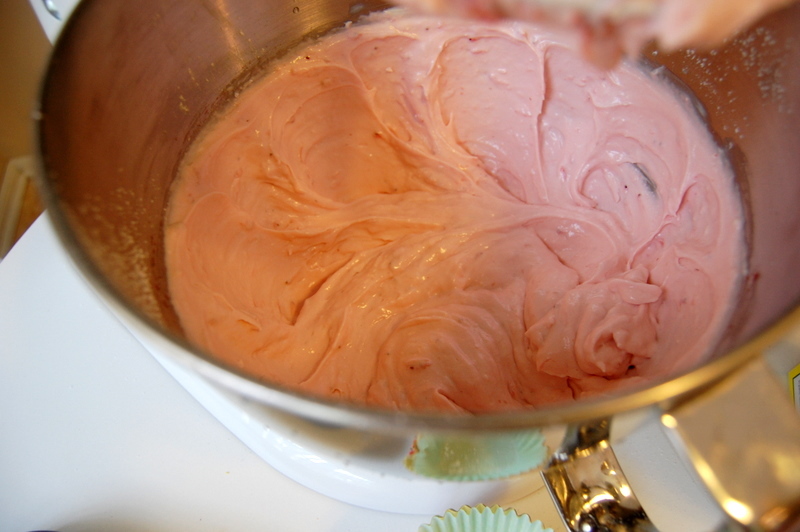 Don’t add too much of the chunky strawberry sauce to the frosting, try adding *only* the “chunks” of strawberry and as little liquid as possible. I unfortunately didn’t do this, so it watered down my frosting so much so I couldn’t pipe it how I wanted to! 2. 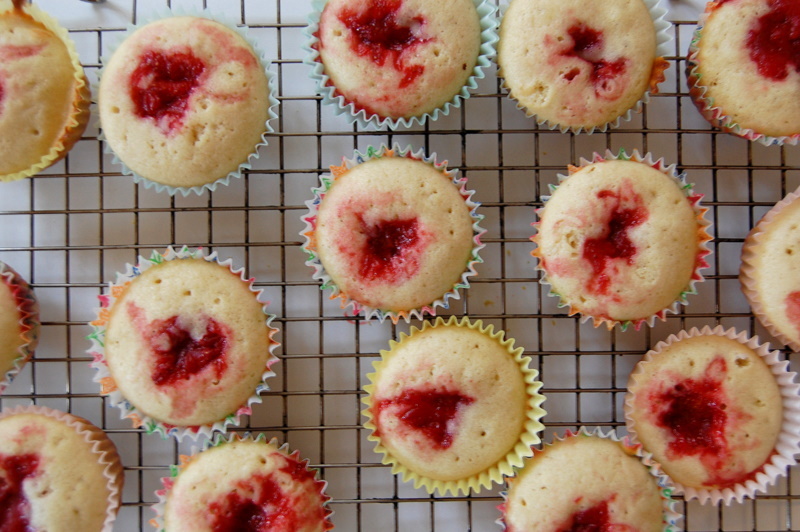 So now to completely go against #1, please DO add as much liquid as possible when filling each cupcake batter with the chunky strawberry sauce, and don’t be afraid to really pour it in. The cupcakes are a little dry without the extra boost from the sauce, so definitely feel free to add a heaping teaspoon of the sauce + liquid. 3. I reduced the sugar amount in the cupcake recipe below by 1/2 cup already, which was perfect for me, but if you have a sweet tooth, add 1/2 cup more. 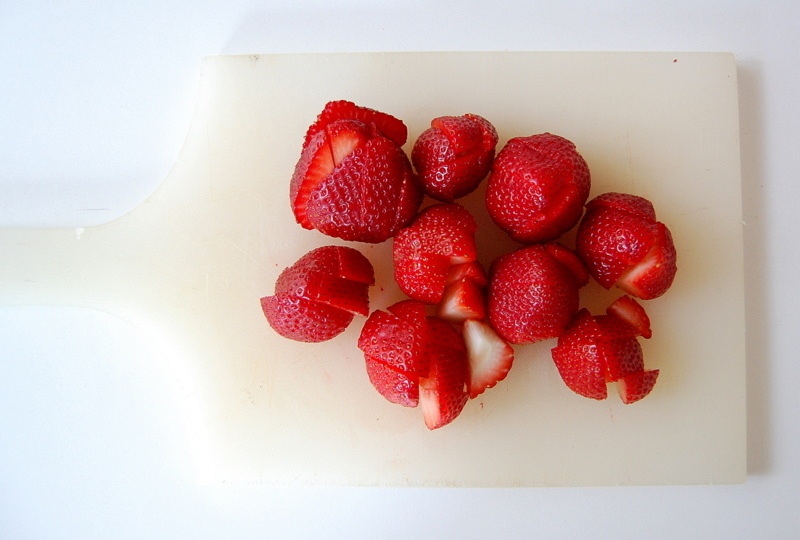 Place strawberries and sugar in a medium, nonreactive saucepan and stir until strawberries are coated in sugar. Mash with a potato masher until about half of the strawberries are completely smashed but some medium-sized chunks remain, about 1 minute. Place the pan over high heat and cook, stirring occasionally, until bubbles form along the pan’s edge, about 5 minutes. Skim any foam from the surface of the sauce with a spoon and discard. Add lemon zest and juice, stir to combine, and bring to a full boil, cooking until foam coats the surface, about 2 minutes. Remove from heat and skim and discard the foam. Let the sauce cool to room temperature. Transfer to a container with a tightfitting lid and refrigerate for up to 3 weeks. 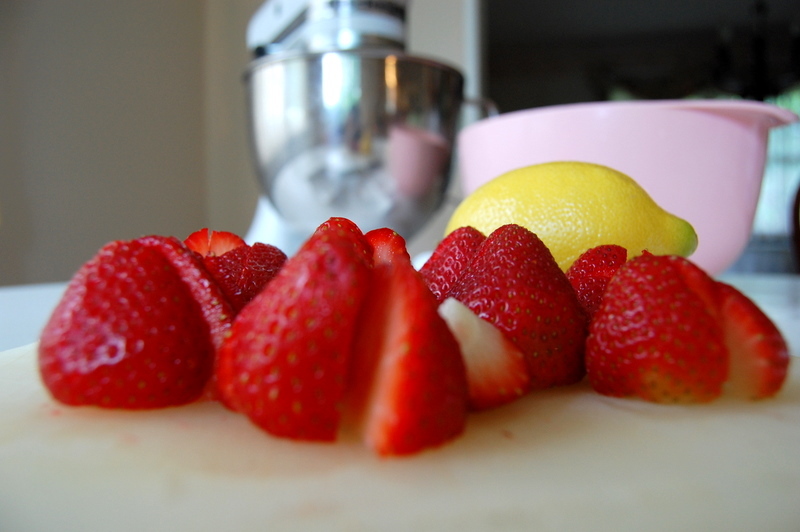 Place all ingredients in the bowl of a stand mixer fitted with a paddle attachment and beat at low speed until the sugar and strawberries are incorporated, about 15 seconds. Increase speed to medium high and beat until the frosting is light and whipped, about 3 to 4 minutes. Refrigerate in a container with a tightfitting lid until ready to use. 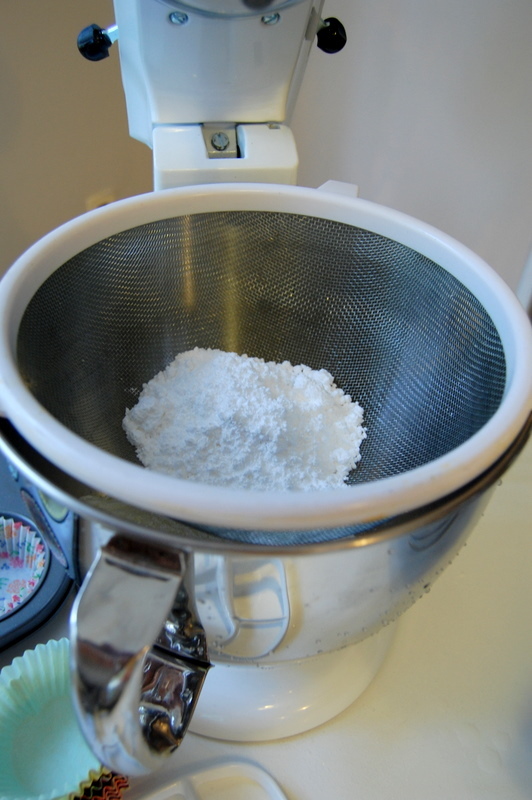 When ready to use, beat the refrigerated frosting in the bowl of a stand mixer fitted with a paddle attachment for 1 to 2 minutes until it reaches the desired spreading consistency. 1. Heat the oven to 350°F and arrange a rack in the middle. Line 2 (12-well) muffin pans with paper cupcake liners; set aside. 2. Place the flour, baking powder, and salt in a medium bowl and whisk to aerate and break up any lumps; set aside. 3. 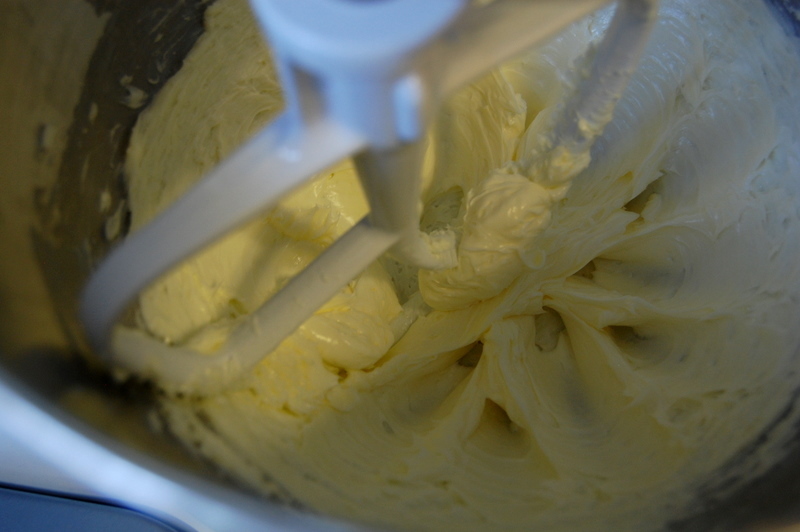 Place the butter in the bowl of a stand mixer fitted with a paddle attachment and beat on medium-high speed until light in color, about 3 minutes. Add the sugar and continue beating until the mixture is light in color and airy, about 3 minutes. 4. Stop the mixer and scrape down the paddle and the sides of the bowl. On medium speed, add the egg whites 1 at a time, beating well after each addition. 5. Next add the eggs 1 at a time, beating well after each addition. Scrape down the sides of the bowl. 6. On low speed, slowly add the milk and vanilla and mix until combined (the mixture will look curdled). Add the reserved flour mixture and mix until just combined, about 15 seconds. 7. Fill each muffin well about three-quarters full. 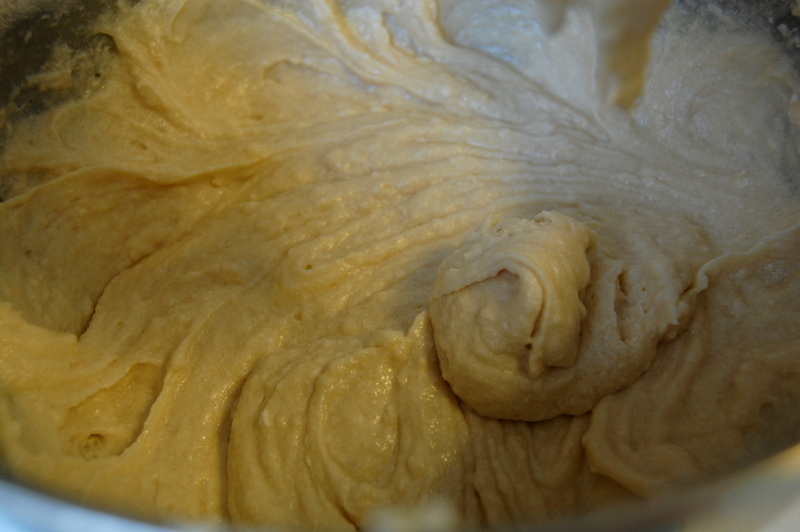 Using a spoon, create a small indentation in the batter by slightly spreading it from the middle out toward the edges. 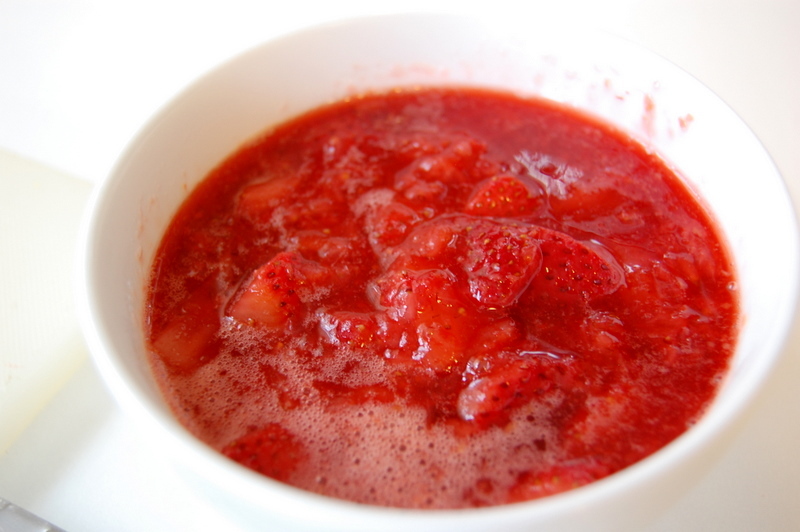 Measure 1 heaping teaspoon of the strawberry sauce and place the back of the teaspoon inside the indentation. Rotate the spoon, letting the sauce slide into the indentation. Repeat in each well. 8. 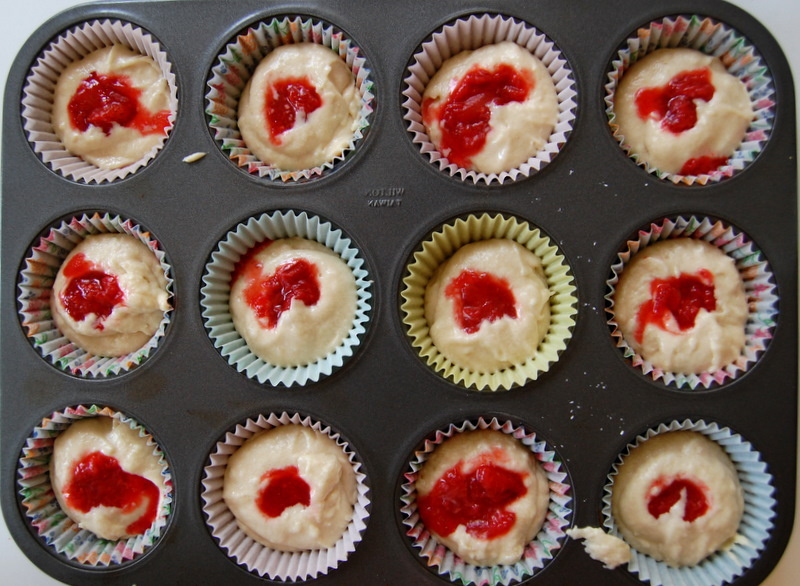 Bake the cupcakes until a toothpick inserted in the center comes out clean, about 18 to 20 minutes. Set the pans on wire racks and let cool for 5 minutes. Remove the cupcakes from the pans and let cool completely on the wire racks before frosting. You are currently browsing entries tagged with cupcake at Career: Housewife.